Never before had escapade to the countryside been so quixotic than one to countryside of Manipur. The vibrant images of blue-green hills, cascading rivulets, canals dotting the landscape, and carpet of flowers adorning the hills followed us. The smog of the Imphal city had thinned, sky turned azure blue and the plains were hued with a golden harvest of paddy. Farmers in their customary hats (Jhapis), working with skythes, slicing their harvest under spring sun. Ryen had announced of an unparallel experience driving through the countryside from Imphal to Loktak Lake. I was assured of a bewitching sight and an experience tabled as ‘must have’. For miles, soft tufts of grass covered the steep valleys like velvety carpets. Tall trees on the hills stood as guardians, overlooking the Imphal city and there I was riding a bike, making my way through these serpentine roads down the valley, being a witness to this marvelous panoply of nature. The photographer in me was in an uncontrolled frenzy, punctuating the ride with numerous stops and occasional ‘oohs’ and ‘ahhs’ of a traveler marveling at this picture postcard display. 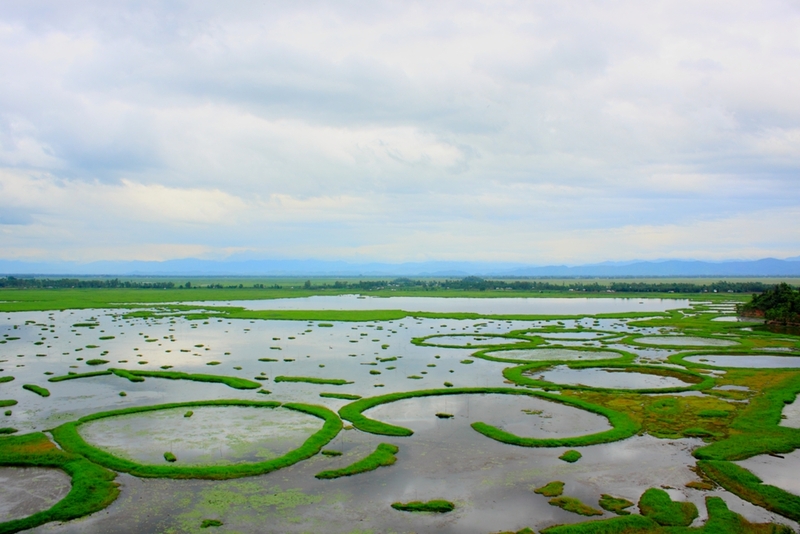 A journey through these surreal landscapes brought us to the Loktak lake, famed as a natural wonder. Ryen took a deep breath, secretly marveling and feeling proud of the natural wonder, hidden in his state. I could see that in his smile. And as for me, to me the lake appeared a bit of anti-climax. I knew Ryen was giving me an opportunity to have an eyeful of the lake, before he could begin with his stories. The raconteur in him was patiently waiting for my cues. I was looking at the natural wonder before me, the floating lake. ‘This lake is said to float because of this thick layer of vegetation, phumdi’ Ryen told. ‘But then why are they termed floating?’ I enquired. ‘Because phumdis keep changing their shape and float on surface water’ he answered. Actually this mass of vegetation is just like an iceberg, with only its tip on the surface and at times when the water level recede, roots can extend upto the bed cover, hold themselves to it and absorb nutrients to remain alive. This mass of vegetation is so thick that an endangered, elusive deer can graze on it. This is the state animal of Manipur, the brow antlered deer or popularly known as the dancing deer because of its casual gait due to hooked hoofs suited to walk on the phumdis. I couldn’t catch a glimpse of dancing deer (locally known as sangai deer), Ryen told me that one needs to come early in morning to see them. There was a time when only 50 of them were left in the wild; today their number crosses 500. A fisherman on Lake Loktak. I smiled at Ryen, he knew the reason. 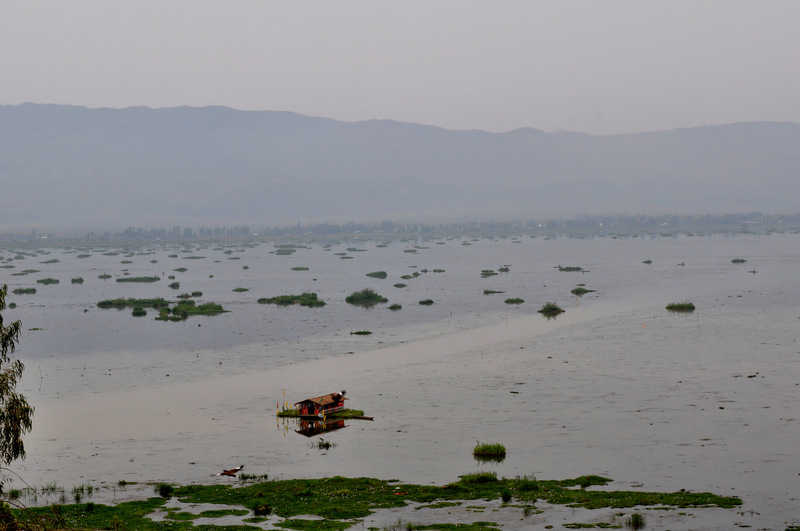 Everything on Loktak is floating, there are close to a thousand huts on or around the lake. Those on the lake are, obviously built on phumdis, hence floating. Imagine living in a floating hut; the Sendra guesthouse on the lake, gives travelers this experience. 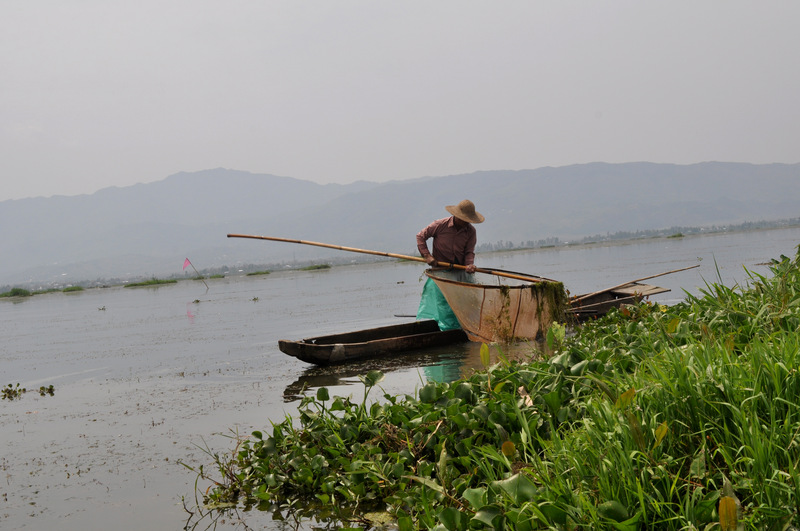 Loktak lake holds the key to local economy. Those settled around the lake are mostly fishermen and depend on the lake for their catch. Now the biggest catch is that fishermen usually destroy a portion of phumdi to make way for the boats to pass, this act looms as an imminent threat to the lake ecology. Loktak lake is also treated as reservoir for a hydel power project. With more water now being stored in the lake, the survival of phumdi and thus the ecology which depends on this vegetation has been risked. Today, the lake hosts two contrasting eco-systems, one with deep waters and no phumdis and the other side with shallow waters with phumdis. As phumdis require shallow waters to grow, with huge reservoirs of water now being stored, their survival has become a question. ‘The lake is now being over-exploited’ Ryen summed up and it was quite evident with the human activity that goes around in the area. The ecosystem is being compromised for unsustainable activities. The population dependent on the lake has quadrupled or more in a decade. Though Ryen expressed his optimism as he said ‘Government seemed to be aware of this, and some studies have also been conducted to sustain the lake ecology’. Ryen asked me for a walk; this obviously doesn’t sound interesting until you get to know that it was on the lake. Walking on Loktak is like being on a trampoline. We hopped onto a fisherman’s boat which was just enough for us to wedge our but inside. The lake is no doubt pristine, interrupted with floating houses on the phumdis. I wondered the irony of the fishermen, who after returning with the day’s catch would have to ask their neighbours ‘Hey, where did my house go?’ and the neighbor would respond ‘Oh! I saw it floating that side’. Strange. 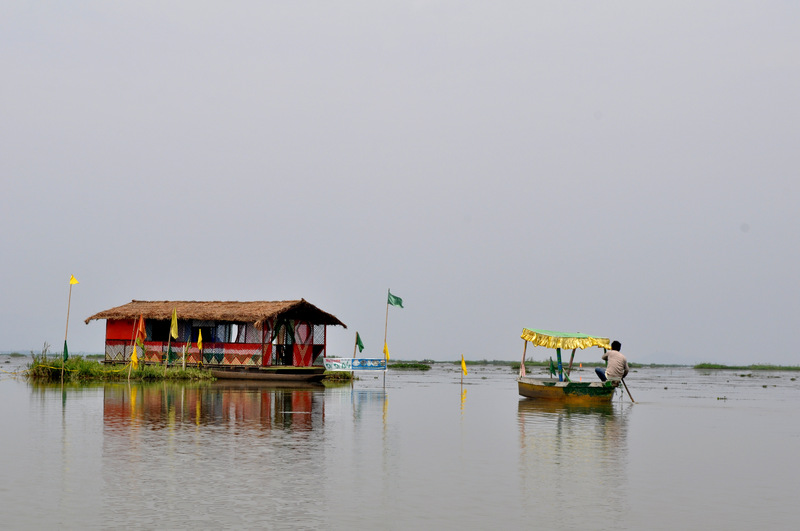 Floating hut on Lake Loktak. ‘We can go to the Sendra house, enjoy a cup of coffee in the middle of the lake and then return.’ Ryen suggested. Having a cup of coffee in the middle of the lake in a floating guest house, it even sounds unimaginable. Though there isn’t a long list ‘to do’ things in this tucked away paradise, it is an elating experience being there. We made our way back through the same winding roads crossing mazes of greenery, and at times the colour palette exploding into shades of greens, browns and yellows. Moments played before us like flashes of light in the sky, the same happy, toothless smile of an old farmer in his paddy field, bursts of laughter of young lads, teens celebrating their moments in a game of soccer like sacred rites and young girls shying away from strangers. I marveled at this ode to nature and frequently slowed down to take in the moment. My thoughts are etched somewhere in this greenery and I have to return to jeweled land to collect it. One can take a cab from Imphal. 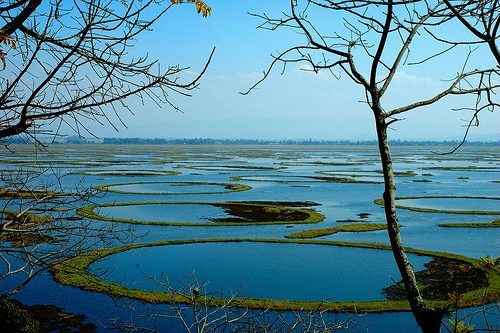 Lake Loktak is around 50 Kms from Imphal and the entire journey takes an hour or an hour and a half. The entire trip can be covered in a day. Do make it to the Sandra Island for some nice coffee. Sadly there aren’t great options (that I know of) to stay near Lake Loktak. The floating lake is amazing.